Replies: 18 (Who? ), Viewed: 5304 times. 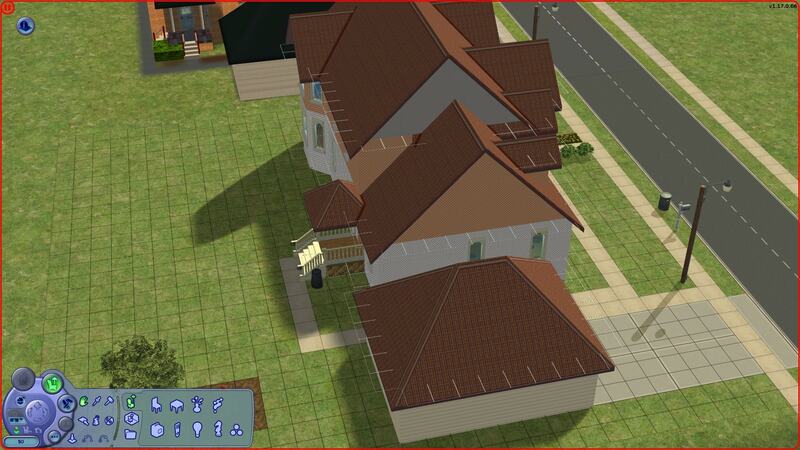 I've been unable to trust myself to work on Bigg City for several months now (I'm beginning to think I made it too complicated), and then I got hold of Sim City 4, started experimenting with making terrains, practiced building using floorplans from The Daily Bungalow, and now here I am with an unpopulated neighborhood to get some feedback on. I have characters and situations in mind for it, but will not be working on those until after I get full use of my brain back and Bigg City is finished (or I admit defeat). 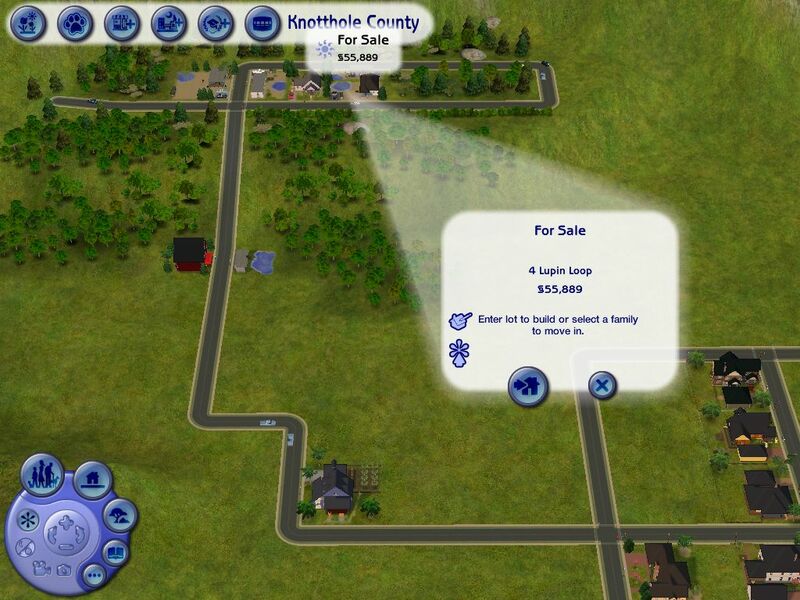 What's here is BG/Uni/NL/OFB/Pets/Seasons neighborhood with a lot of lots, most of them empty except for fixtures, a few intended for characters and furnished to suit. 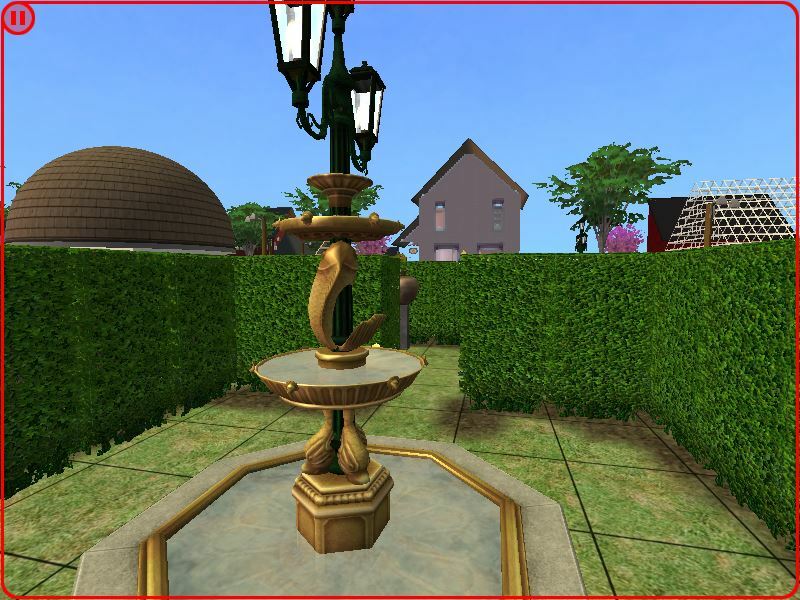 Many of the Community lots were built for specific characters to own; others are municipal buildings; a couple (The Old School and Empty Offices) are basically set-dressing, though I expect player ingenuity can find a use for them. 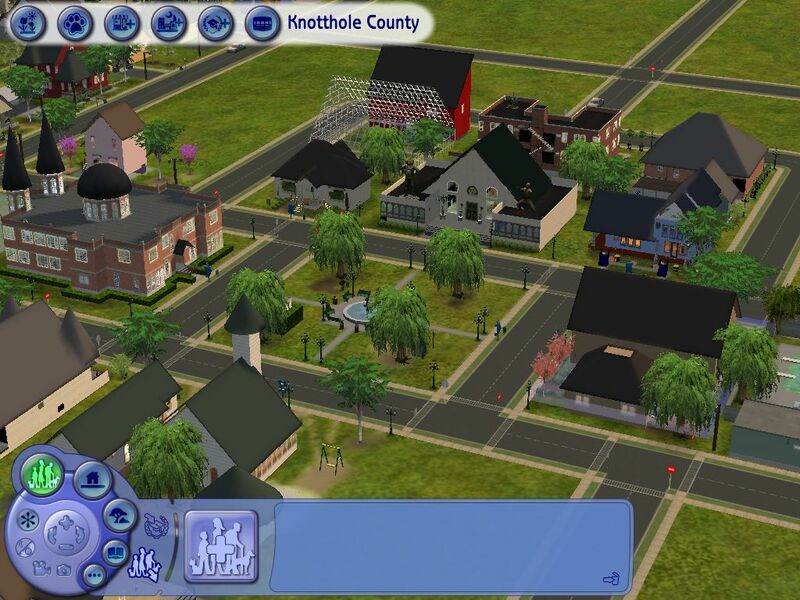 Knotthole County is conceived as a former rural center that's been in decline, and is now struggling to restore its economy at the same time that developers are trying to turn it into just another bedroom suburb. The map has six distinct regions, most of them small: the town proper, with its downtown and residential districts; Lupin Loop, where the local werewolf clan parks its trailers; The Greenhouses, where the plantsim family guards its secrets; the Development, where the new tract houses are going up; some outlying farmhouses; and, perched high above it all, the cabin of Granny Knott, who has always lived up there and who is related to half the county. It's the sort of place where everyone has a pickup and a garden, and personal and business rivalries drag on forever. 1) Would there be any market for this as an empty hood? 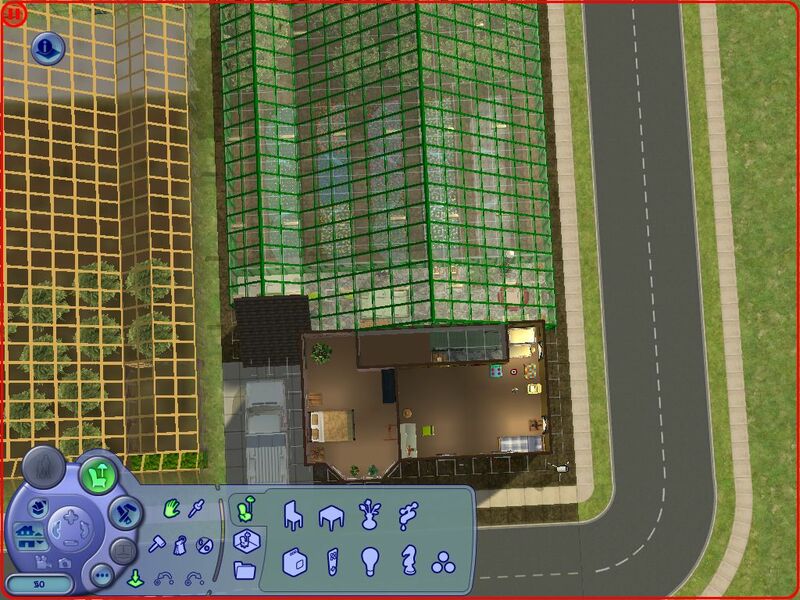 I'm a little proud of some of my residences here, but I can always upload those separately; and some of the lots are so character specific (the Greenhouses, for example) that I'm not sure the neighborhood itself would be any use to anybody without the characters in it. 2) With what, if anything, should I fill up the blank spaces around Downtown? The original idea was to build up the four sides of the square and most of a ring around it with owned businesses and municipal properties and leave the rest for the player to build up to suit themselves; but even after putting in a couple of owned businesses and an empty store, this makes the empty ring between the core of downtown and the residential areas look really empty. 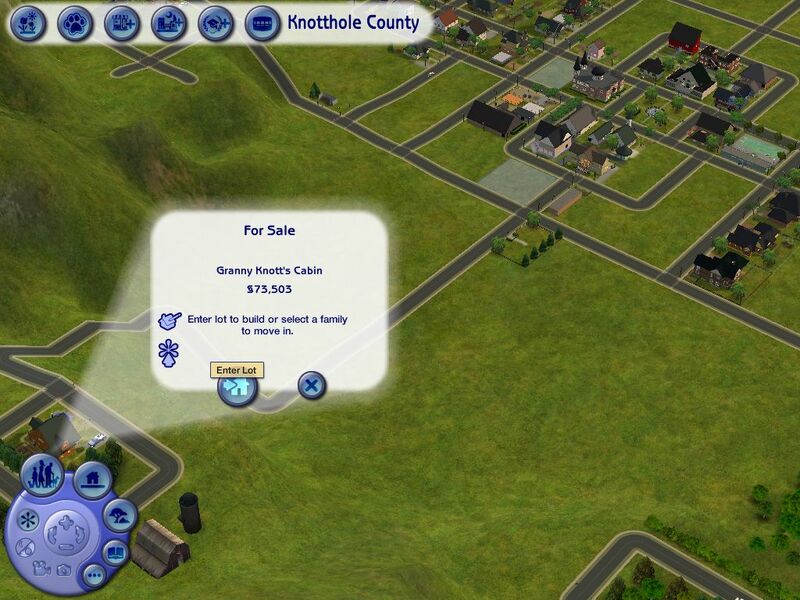 Existing community lots are Knotthole Square; Knotthole County Library; Knotthole Community Center; Knotthole County Swimming Pool; Ecumenical Church; the Old School; an Empty Store; a clothing store; a grocery store; Portal Books and Games; a toy shop; a Beauty Store; a feed store and nursery; Empty Offices, Knotthole County Playground; an arcade and skating rink; a cemetery; a Flower Stand; a Produce Stand; a Bait Shop; Boone Doggle's Barn Dance Hall; and, out in the new development, a Greasy Spoon and a Convenience Store. I feel like I've pretty much covered the bases. 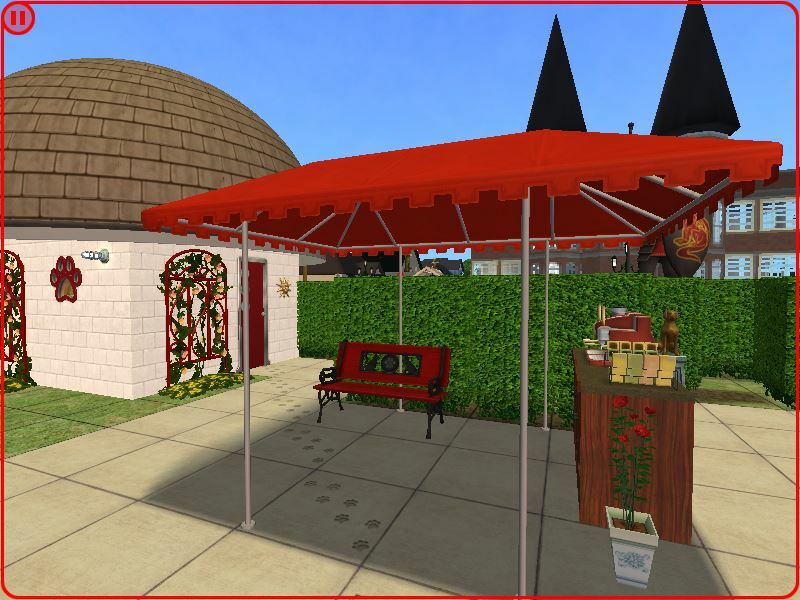 I could add an old cafe, but that should be owned by one of the old families and I don't want to stick players of the populated neighborhood with an owned restaurant, since they're notoriously hard to run. 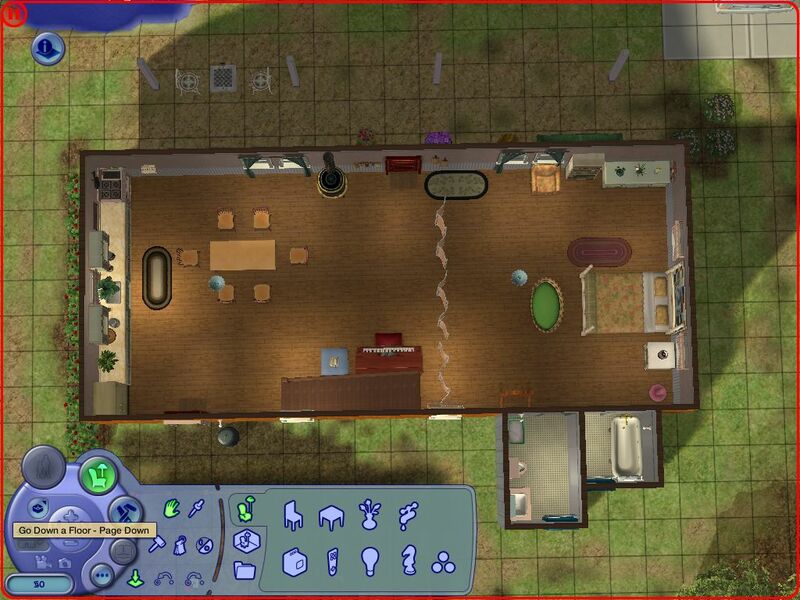 Theoretically I could make a Lodge, Fire Station, Police Department, Local Paper, and/or a Medical Office, but I don't know what I'd do to make any of those worthwhile without adding CC, which I'd rather not do. Building a bunch of empty storefronts sounds boring, both to build and for the player. 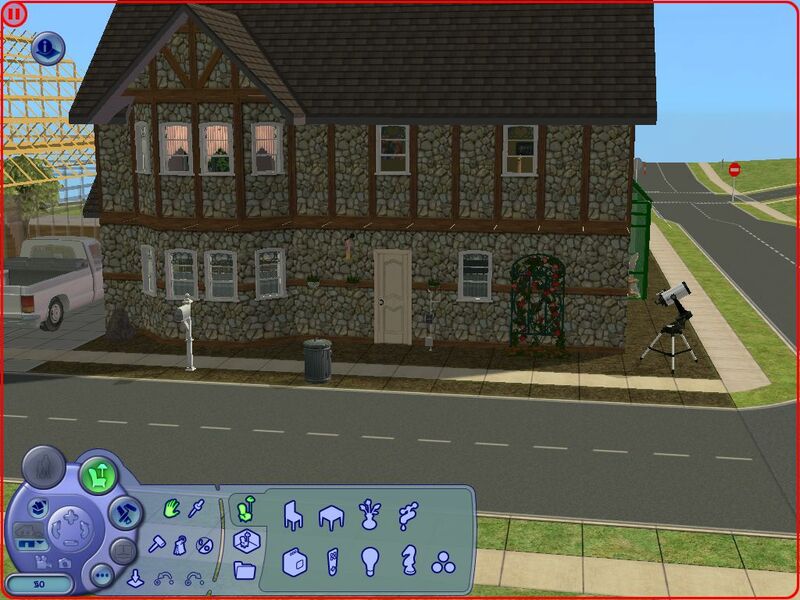 I could build residences here forever, both from floor plans and from my own memories of what houses in this sort of town are like; but I think I've already made more than anyone could possibly need! Anybody who wants to playtest the lots or critique my buildings would be doing me a great favor, but those two questions are my chief excuse for troubling people with this, at this stage. Thank you for your time. If you don't know how to find it, you don't belong here. 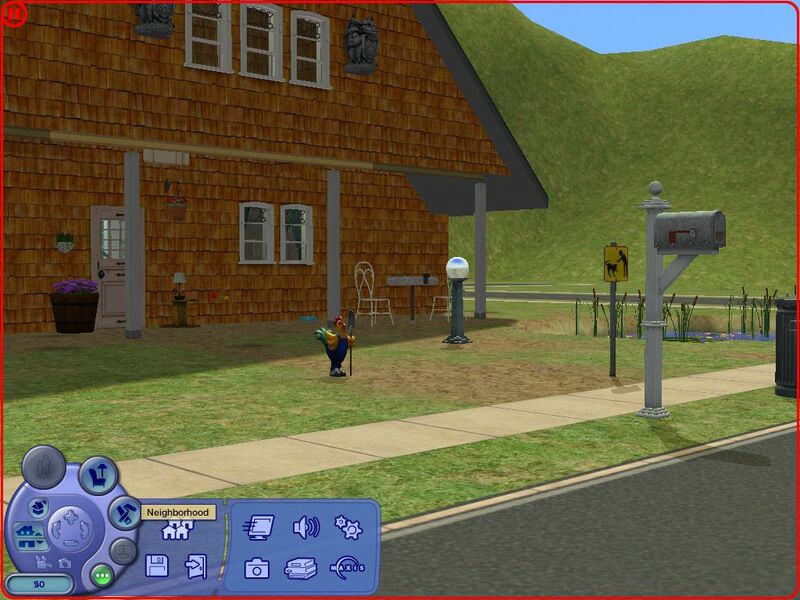 Description: Empty Neighborhood on new terrain; requires all EPs through Seasons. Oo, this looks nice. I like the small rural city feel to it; it feels familiar to places I've been. I have not even begun...okay, I've made a lot of notes, done some character designs, and experimented with things that belong in the neighborhood that I have no experience with. But I really will be finishing Bigg City before I do more than that. Of course you're the first playtester I think of, but you've been around so little lately I've been afraid you were having too much life crap going on to have much time for that sort of thing. (I miss you.) Which is certainly something I understand! 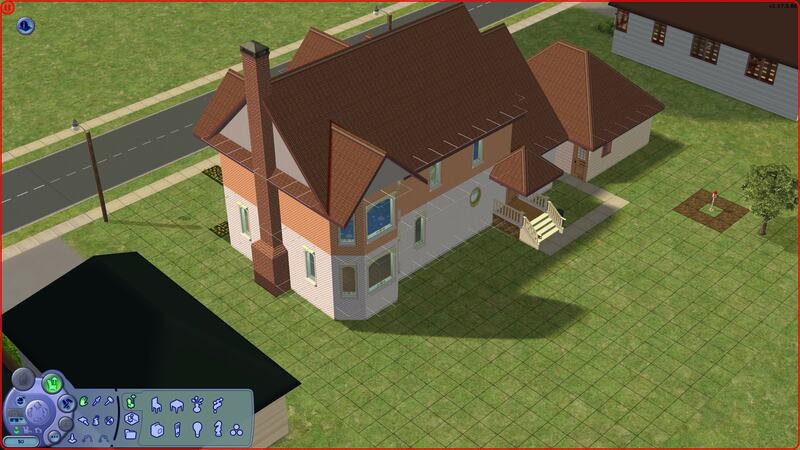 I'm getting back into the simming on the weekends Due to Life Things, I've been staying with my parents during the week and I've promised their computer that it never has to run Sims 2 ever again. ETA: I thought I should post a few more pictures, of the houses I think are most problematic for the marketability of the empty neighborhood. 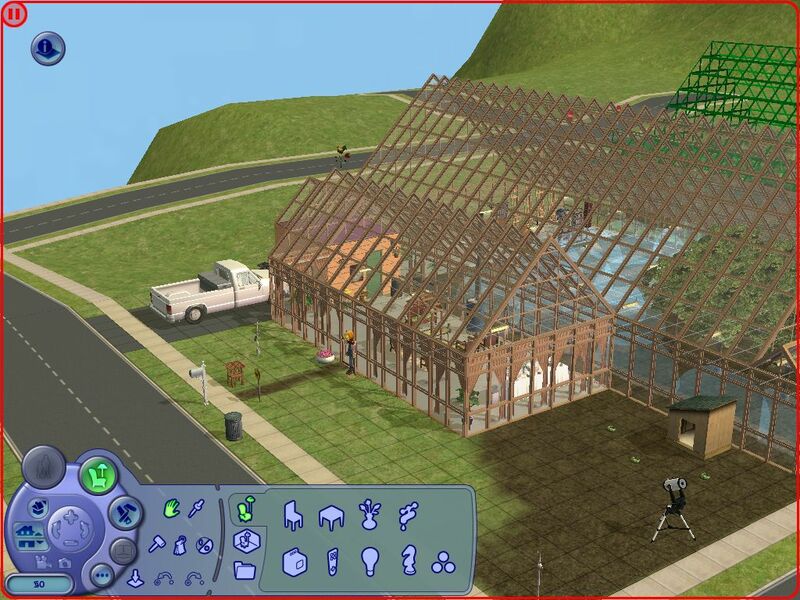 The Greenhouse is intended for a household of four plant sims (more if they can't manage the truck farm without working constantly) and the Greenhouse 2 is the home they built when one of them married one of Granny Knott's daughters and had a son. 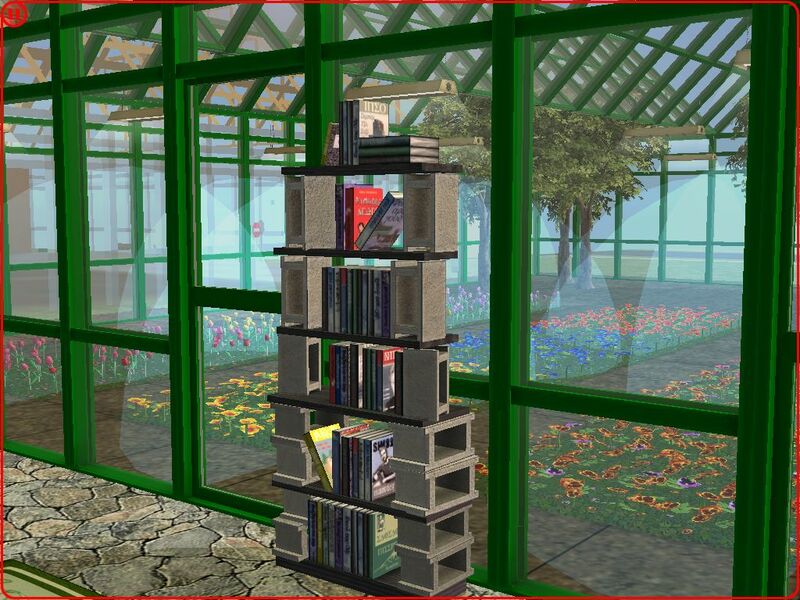 The all-plantsim family grows vegetables and fruits, the half-human one grows flowers and fruit. #8 8th Oct 2017 at 9:21 PM Last edited by Jawusa : 9th Oct 2017 at 10:19 AM. OMG! I didn't know that you have created a new neighborhood. It looks awesome so far! 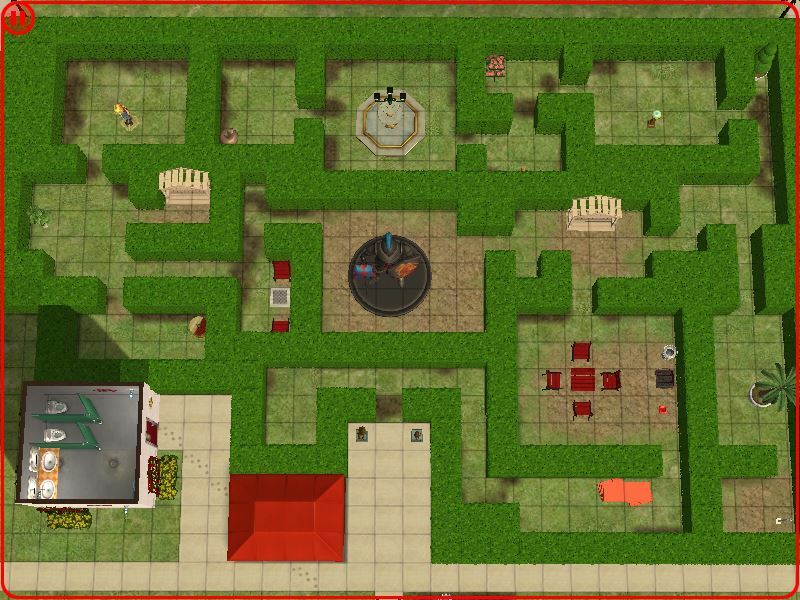 Now, I can't wait to have a look-around and playtest this neighborhood. Love the name of the neighborhood! Edit: Okay! I've had a quick look-around and I'm already impressed with the neighborhood. The houses are so beautifully made! They look really unique! Great job on them. 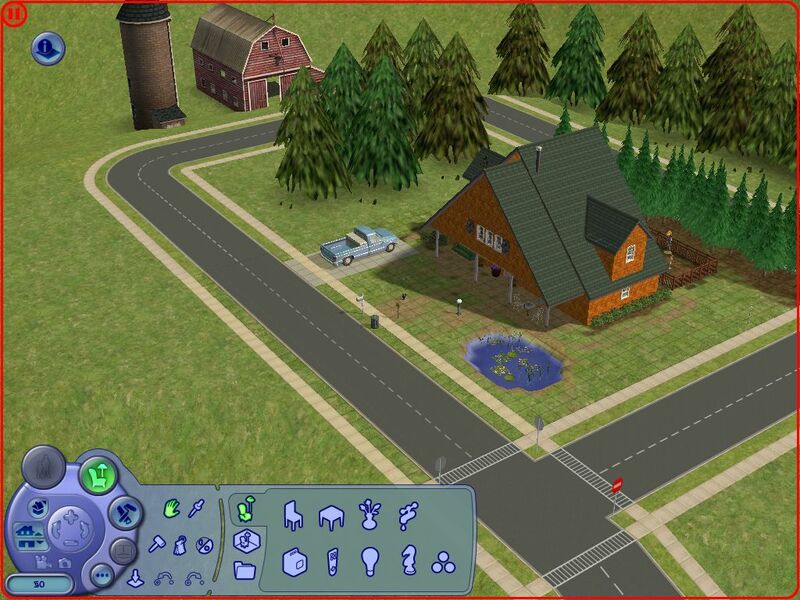 The town reminds me of EA's Appaloosa Plains, a neighborhood which came with The Sims 3 Pets EP... so if we get a similar town for TS2, there'd be another reason not to play The Sims 3! Yay! And as I see, there're a lot of lots which could be run as businesses - so it would also make a nice alternative to Bluewater Village. 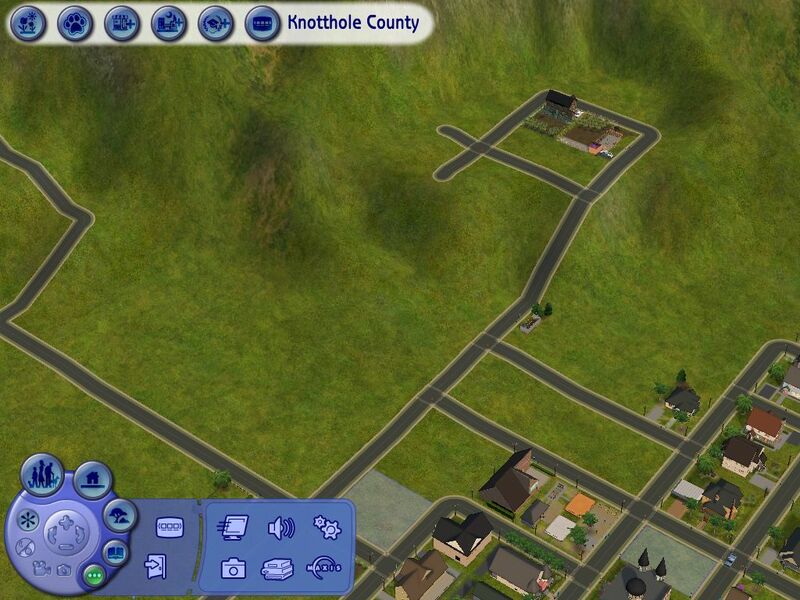 I'd love to attach this neighborhood as a shopping district to my Widespot + Land Grant University setup. 1) I'd download the inhabited version anyway. It's much more fun to explore new families than new lots. And if I look at the downloads, I see that the inhabited versions usually are the most downloaded ones. So people tend to download the inhabited versions instead. 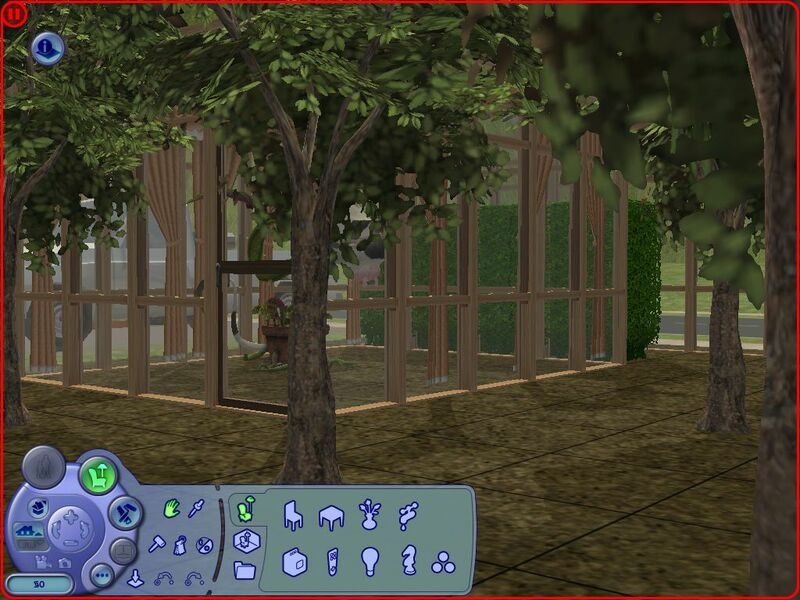 2) Maybe you could add some trees there. Maybe the pink ones or the yellow tall ones... Then, you could kind of create a row of trees - which would fill the empty spaces a little. By the way, I noticed unpainted walls in 13 County Street, but that's the only thing I found so far. This is very much a long-haul project and the more feedback I get early, the less I have to fix down the line, so peek away. So far it's had 13 downloads and feedback only from Aegagropilon and Jawusa. I expect you'll find a lot more unpainted walls, especially on gable roofs, and possibly rooms without doors, houses without lights, etc., because most of them have been built in a state of Health Crap. I was mostly working off of house plans and I gave myself a routine to minimize the chances for carelessness, but sometimes I just get lost. 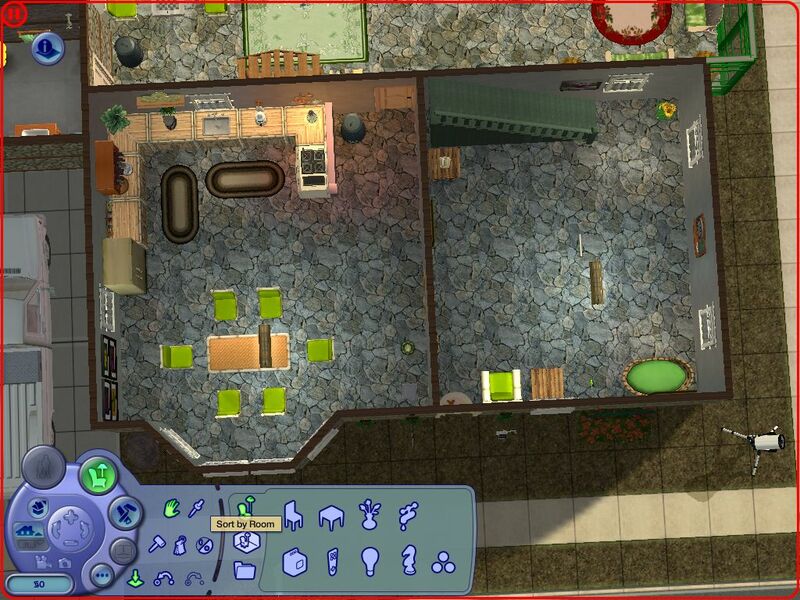 And Aegagropilon has pointed out to me that I overdid my "consistency in flooring" preference quite a bit. Didn't get time to playtest it last night, so I'm typing this up with my game running in the background. I kinda get rambly, so....yeah. Again, painted walls and sufficient doors. What took me by surprise was the interior. It is bright and colorful, with loads of patterns. Now, usually, I go through these type of houses and am like -"need to change this, hurts my eyes". This one though, it looks.......nice. There is a certain harmony among the variety of colors and patterns, and I like it. 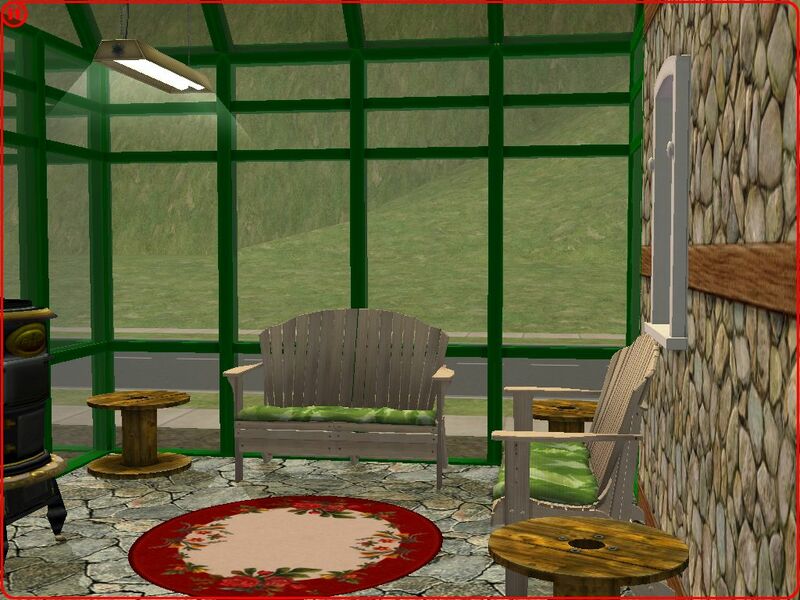 The loveseat is another thing that I don't use in my game, looks a little out of place, but this house inspired me, and I discovered that it has other colors, except that red one. 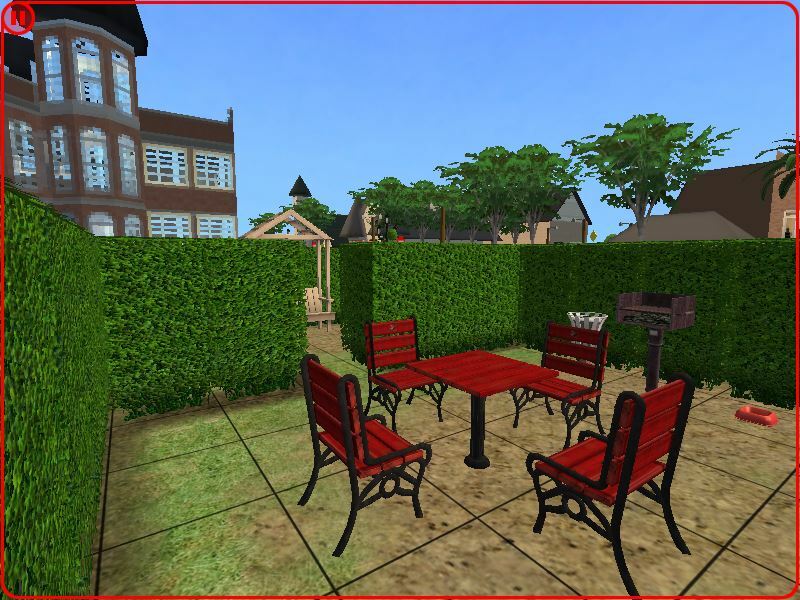 I liked the fenced area for the dogs, a nice, realistic touch. And oh, the car!! I loved the color choice. It compliments the house nicely. Doors - check. Wall paint - check. The overall pink-lavender color scheme I like, and the blue......TV room I also like. The sudden change in color scheme did throw me off balance, but I like it. I like the contrast. 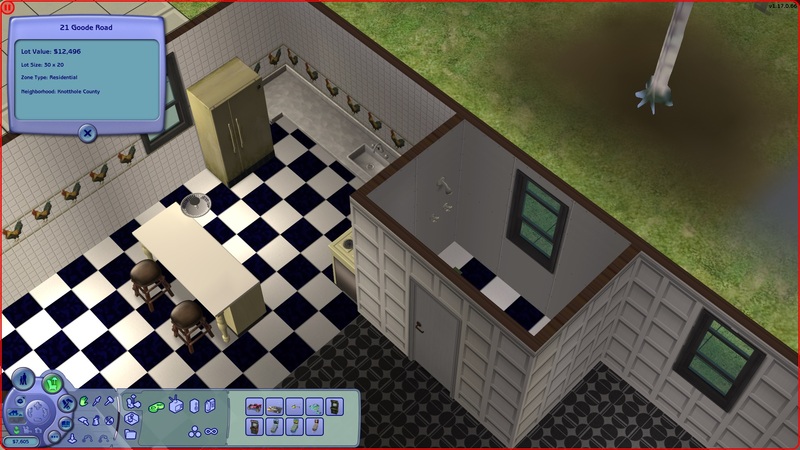 I like the kitchen area, how it is a little cramped but still has a comfy feel. 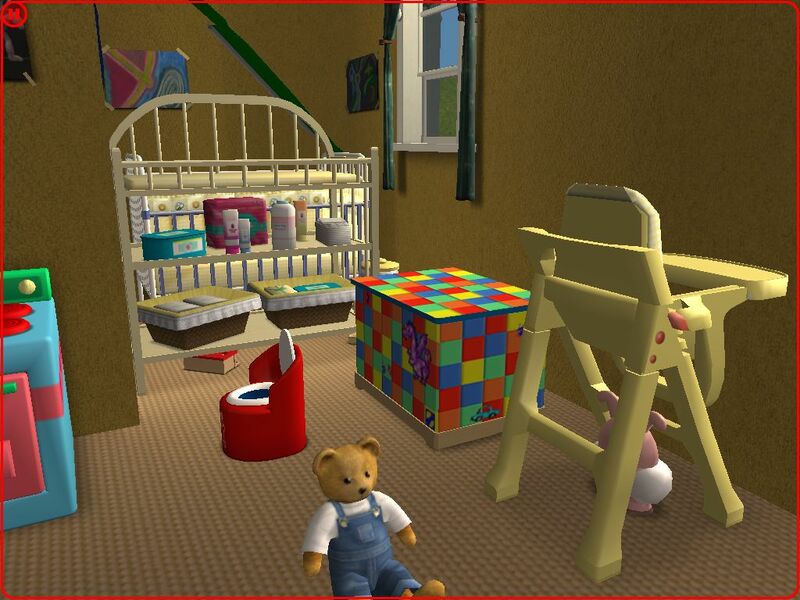 I guess you could do something else with the floor of the dining-bedroom-nursery. It's a bit monotonous. The little 'nook' for the easel is inspiring, and I didn't know about the 'Lantini' lights (the ones on the string), so that's quite a discovery. And oh, the flamingo, and the balloon give the house a 'lived-in' vibe, which I like. Paint and doors are present. 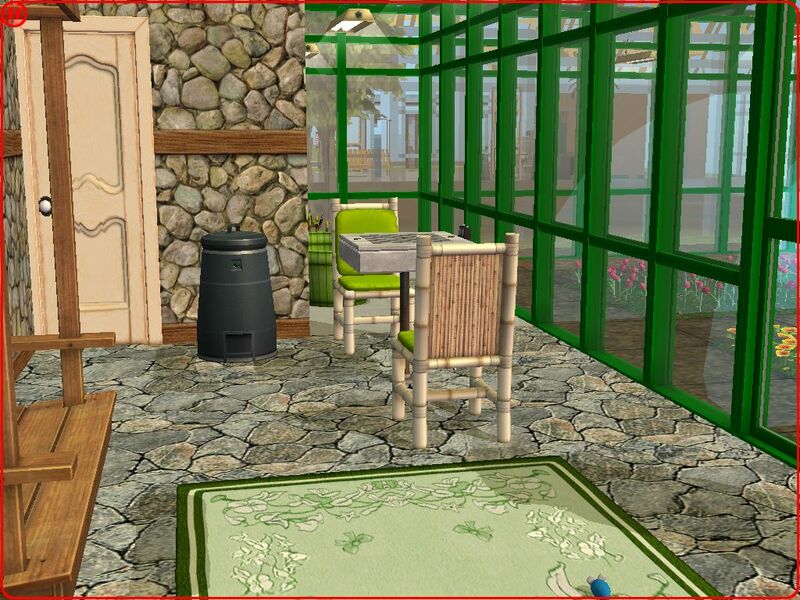 I like the furnishing and lack of decor, gave it an empty, abandoned vibe. I'm guessing that is the plan ? The floor could use some work though. Simply putting down separate tiles in the bathroom will do the trick. The gym locker in the bedroom is probably a bit too bright, but it doesn't look 'bad'. Weirdly complements the BBQ outside. Enough doors, and paint on all walls. The mix-n-match of the walls I like. The contrast between walls and floor I like. Flooring is a bit boring though. I'll advice you to change the......format of the water lilies. The ones that have flowers along with the lily pads are kinda forming a line. Will look a bit more natural if they are kinda.......scattered around. I like the awnings over the windows. Not only do they look nice, it's also different. I've never seen awnings on single windows, but oddly, these look really good. I like them. Walls and doors present. This lot, I really, really like. I like the mismatched chairs, I like the decor........It truly feels like a barn. And a dance hall inside said barn. 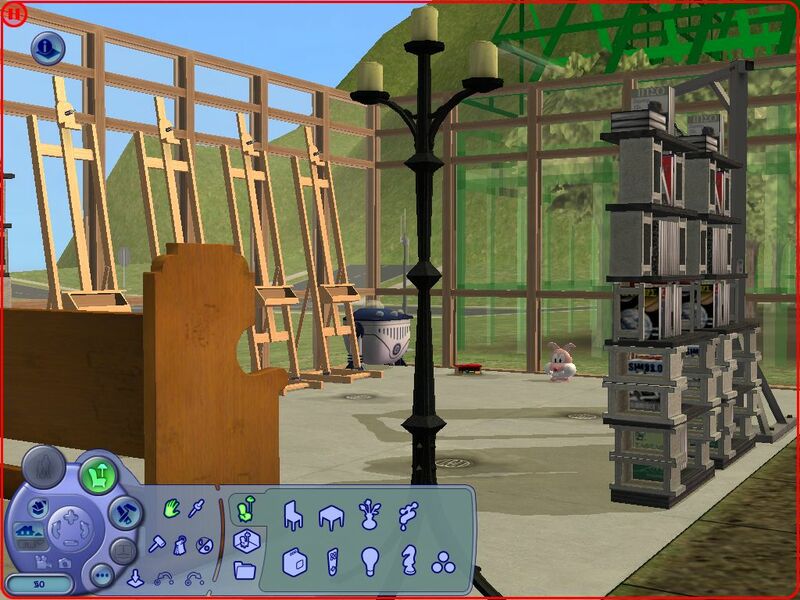 It looks so realistic.........(I should take some building/decorating tips from you. Sometime). Door is okay, so are walls. There isn't much to say about this lot, apart from the fact that it very much looks like a bait shop (although I've only seen those in pictures/movies) I liked the tires and alarm clock, but can't really pinpoint why. It just fits. 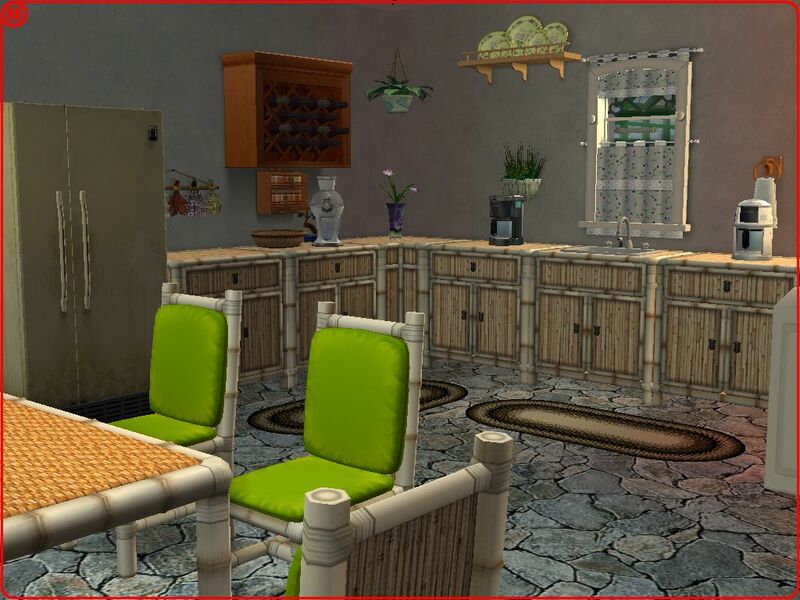 I also liked the fact that the lampshades do NOT match, and the placement of the sink. Now, I don't know for sure if it is meant to be run by the player (looks like it) or not, but if it was to be run as a business, then the routing is nice and easy, at least to my eyes. It's also aesthetically pleasing, along with being easy to handle, so that's another big plus. That's all the lots I have seen till now. I'll go through more tomorrow. Just a few more lines, and then I'll stop. 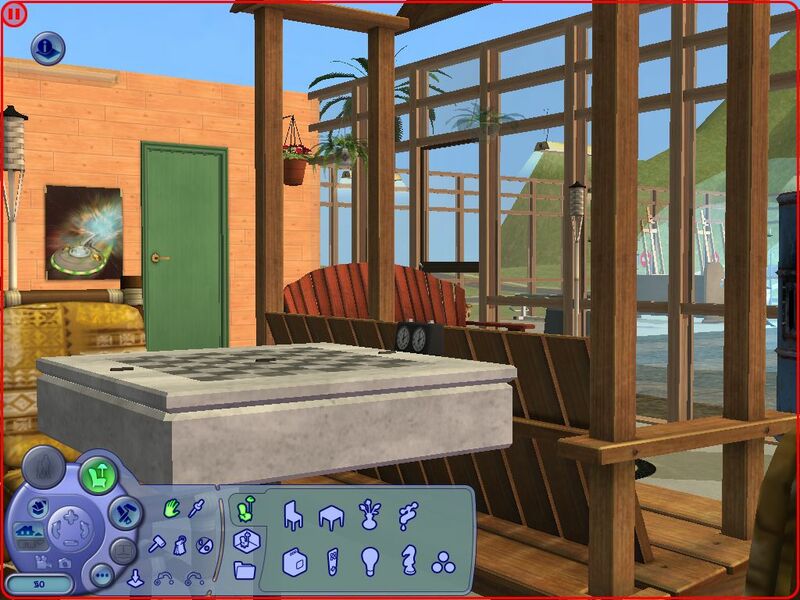 1)- I love new sims. I do. And I always go for the inhibited version when downloading a new 'hood. 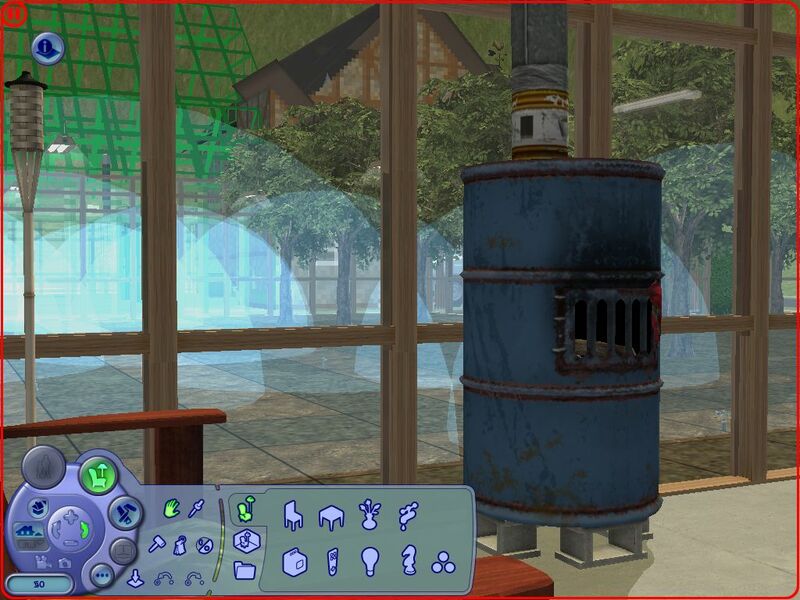 That said, I would most probably download this hood (or any hood that you make) solely because it looks so realistic and nice and I can't stop gushing about it. 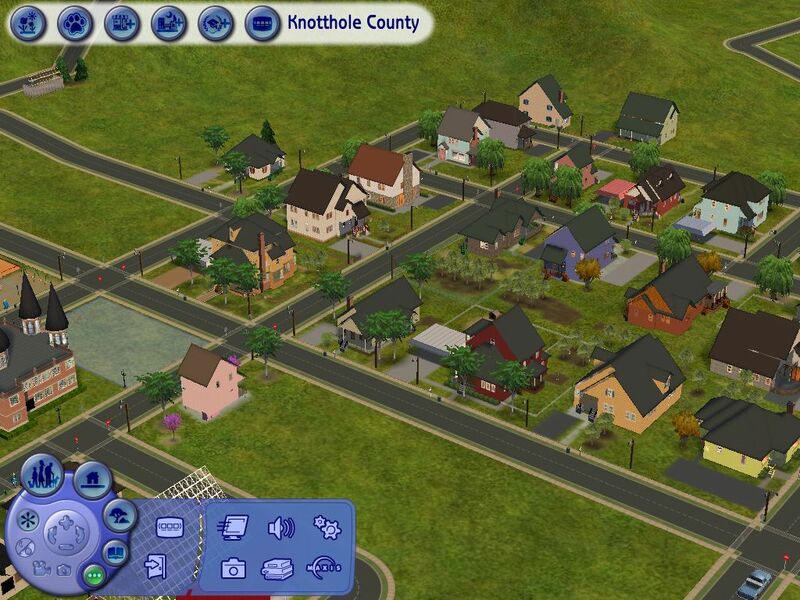 I'm sure that there are plenty of others who will also LOVE to download this 'hood, with or without sims. 2)- The hood looks a bit empty on the sides. Maybe you can add some trees ? I love it - very good work, Peni. You can always give downloaders the choice - with or without sims - I think there will be a market for both. This looks very nice, and I love the country feel to it. I'll be downloading and playtesting, though I'm not sure if I'll have the time to leave feedback immediately. Either way, count me in as interested in the final version of it whether with or without sims! I always do love inhabited hoods, and seeing hoods with time and energy poured into the characters is always lovely. I want to continue playing the story that's already been "set up" for the hood. #15 21st Jan 2018 at 8:22 AM Last edited by Jawusa : 21st Jan 2018 at 2:02 PM. 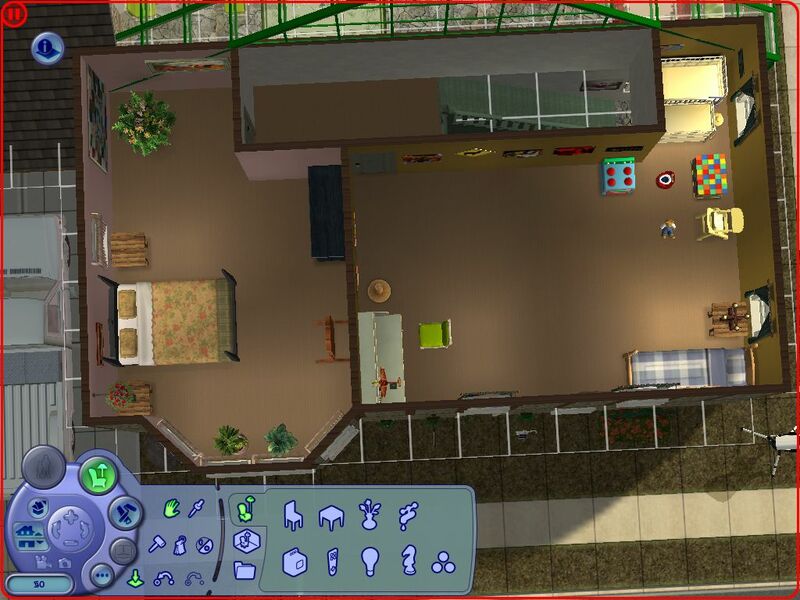 I created a new sim and moved her to 21 Goode Road. Lovely starter. The only thing I've noticed is an unpainted bathroom. But that's nothing, really! I like that it's very cheap; only §12,000! I never manage to get it so low. 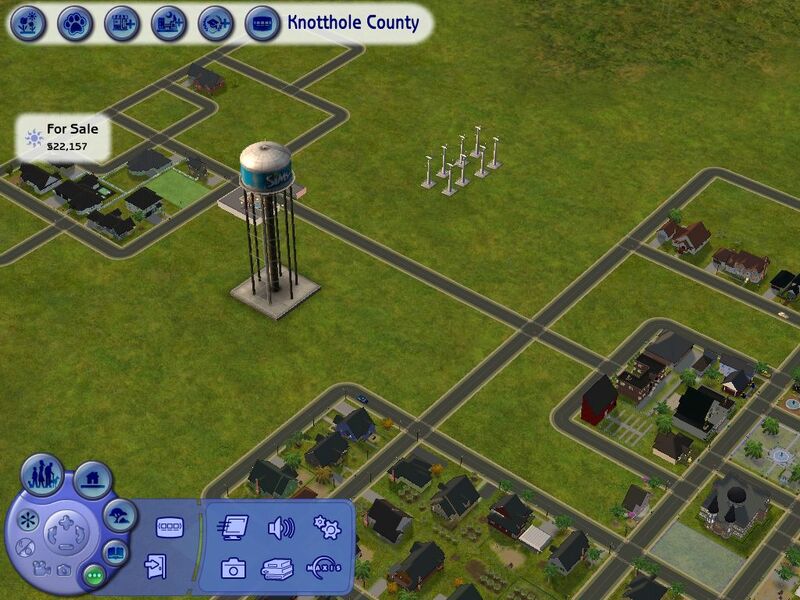 So, I finally got the second disc drive I need in order to run AGS with anything other than M&G, and decided that, though I'm still not mentally acute enough to wrap up Bigg City, I could at least build the last few lots in Knotthole County. So I filled in the space behind the Old School with the Children of the Corn Maze. See attachments. I'm of two minds about it, so what do y'all think? Too annoying to play? Just the right amount of annoying? Needs that little push to get it over the top? 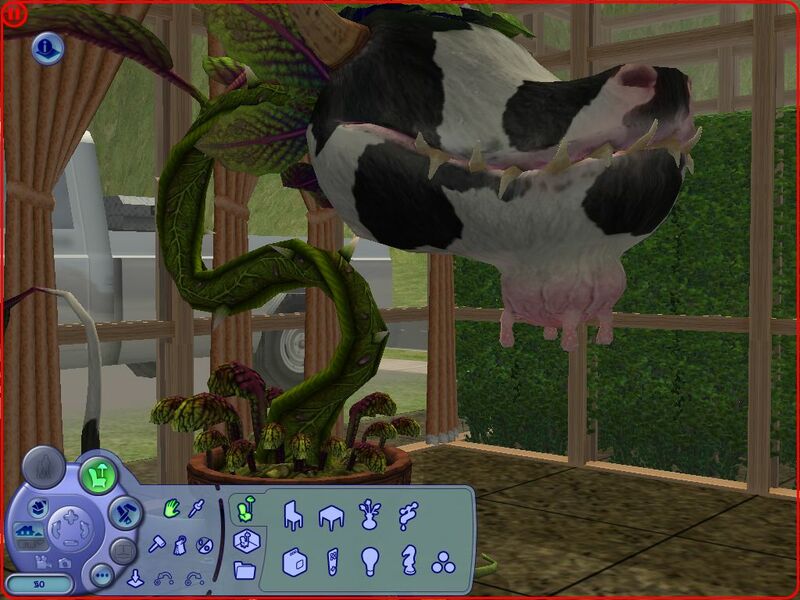 I wish it could be an actual corn maze, but not without CC, and in any case the only custom corn I'm aware of is too short. #17 19th May 2018 at 1:08 PM Last edited by Jawusa : 20th May 2018 at 12:32 AM. Hmm.. I wouldn't widen the passages... that would make it less look like a corn maze. But I can understand your idea behind that, it would reduce routing errors. But as for the lot, I'd keep it. It's a unique type of park! 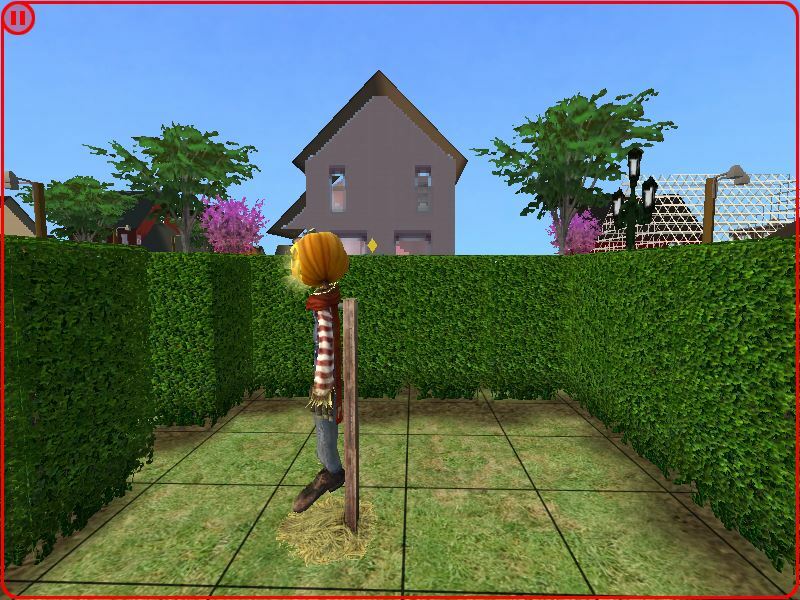 A hidden swing set inside the corn maze would be cool, but I guess there isn't enough space for that! I can't wait to play this lot at night with the Moon werewolves... or how were they called again? Lupin? Is this being updated? 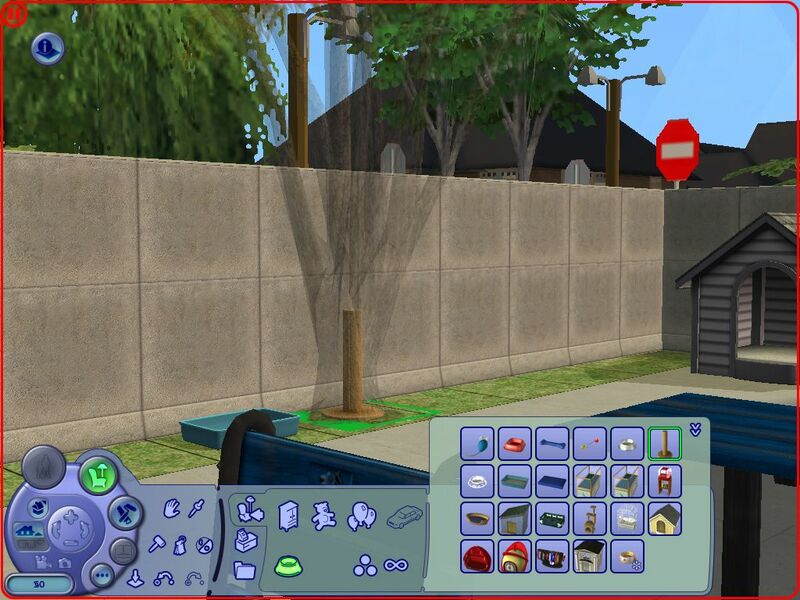 I love your neighborhoods! I've had a lot of Health Crap which made the process of developing a neighborhood problematic. Things seem to be looking up, so maybe...soon... (But I've thought this before.) It'll be done when it's done.